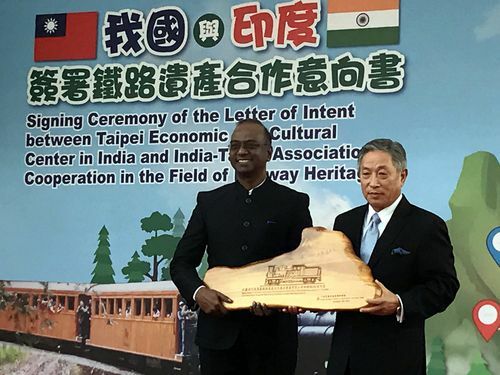 Taiwan and India signed a letter of intent for cooperation on railway heritage Dec. 24 in southern Taiwan’s Chiayi City, the latest in a series of measures to forge closer collaboration between the two nations in line with the government’s New Southbound Policy, according to the Ministry of Foreign Affairs. Tien Chung-kwang, Taiwan’s representative to India, and Sridharan Madhusudhanan, director-general of the India-Taipei Association, signed the agreement on behalf of the two sides. The LOI seeks to foster cooperation between the countries on the protection, management and maintenance of their mountain railway systems. Taiwan and India both constructed mountain railways between the late 19th and early 20th centuries, comprising such lines as the Alishan Forest Railway in southern Taiwan’s Chiayi County as well as the Darjeeling Himalayan Railway, the Kalka-Shimla Railway and Nilgiri Mountain Railway in India’s northeastern, northern and southern regions, respectively. The LOI for cooperation on railway heritage was the third bilateral document signed by the two sides this year, following an air services agreement and a memorandum of understanding on agricultural cooperation, both concluded Sept. 12 in Taipei City. These accords are intended to bolster exchanges in the fields of agriculture, aviation, culture and tourism. India was Taiwan’s 18th largest trading partner in 2015, with bilateral trade volume totaling about US$4.8 billion. In the months ahead, Taiwan looks forward to deepening its partnership with the South Asian nation in areas such as trade and economy, culture, science and technology under the New Southbound Policy, according to the MOFA.